After two years of development using state-of-the-art online software methods and standards, we’re pleased to announce the release of Ergoweb Enterprise™, ergonomics software system (software-as-a-service) for physically demanding work environments. There is no one-size-fits-all ergonomics process. That’s why we built Ergoweb Enterprise™ as a flexible, scalable and customizable online ergonomics software system for corporations and institutions. It’s a portal for all your ergonomics related needs, giving you a single point of access and control over your ergonomics process and all its components. No matter how mature your process may be, Ergoweb Enterprise™ will deliver measurable improvements and ROI. If you’re just getting started, it’s a turn-key solution. If you already have a process in place and want to revitalize or take it to a new level, it’ll help you grow the reach, influence and success of ergonomics in your company. Our ergonomics software system has created proven results for many customers. It’s already been tested and rolled out to large and small teams with varying levels of ergonomics knowledge and needs, and we invite you to join us as we grow the value of ergonomics with our clients and partners. 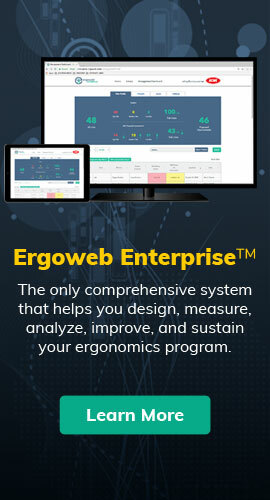 If you’re responsible for ergonomics in your organization, we invite you to schedule a demo and see how Ergoweb Enterprise™ can unlock significant value for you and your company. If a sustainable ergonomics process is your goal, Ergoweb Enterprise™ will help you succeed.